The United States Army private responsible for the biggest intelligence leak in US history finally begins trial in a military court on Monday, after more than three years of pretrial detainment. 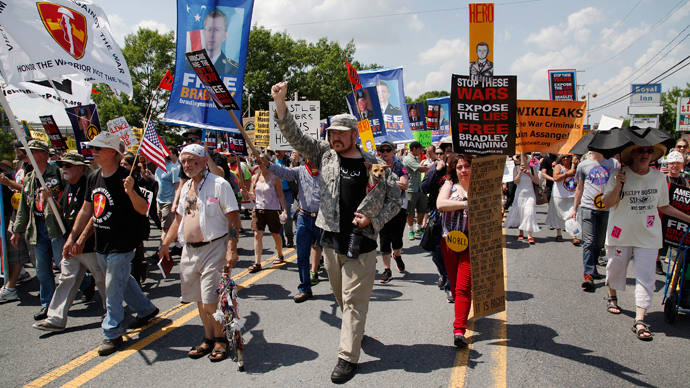 The court-martial of Private first class Bradley Manning began in Ft. Meade, Maryland this week and is slated to run throughout the summer. Manning, 25, could be sentenced to spend the rest of his life behind bars if convicted of aiding the enemy, the most serious of the more than 20 counts he's been charged with by Army prosecutors. US authorities arrested Manning in May 2010 and accused him of sending hundreds of thousands of sensitive government files to the anti-secrecy website WikiLeaks. Earlier this year Manning admitted to sharing the documents, including State Department diplomatic cables and military war logs, and pleaded guilty to a number of lesser counts carrying a maximum sentence of only 20 years. Prosecutors say those files benefited the operations of Al Qaeda in the Arabian Peninsula, however, and are asking for life in prison. 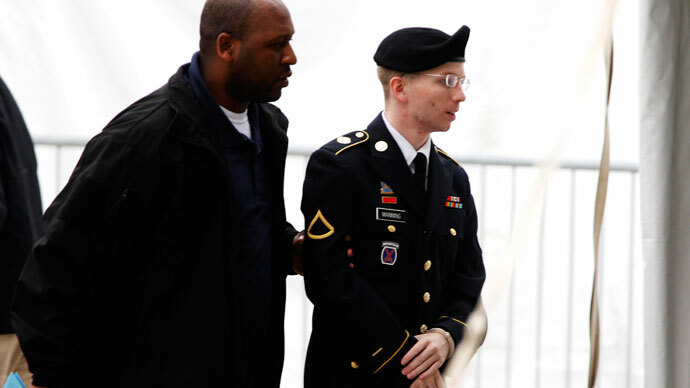 Dozens of witnesses will be called during the trial, including a handful of military personnel whose testimonies will be conducted behind closed doors to protect the sensitive nature pertaining to Manning’s alleged crimes. Pretrial hearings in the case have been conducted off and on at Ft. Meade since late 2011, but Manning himself has only had the opportunity to address the court at length on a few occasions, including in February when he testified to leaking the documents. Ellsberg, like Manning, was charged with violating the Espionage Act after he gave military documents to the New York Times in 1971 that became known as the Pentagon Papers and has been credited with many for helping end the Vietnam War. Manning “saved American lives” by going to WikiLeaks, Ellsberg said. Ellsberg defined what is happening to individuals like Manning as a “war on truth telling, truth telling specifically about truth that the government doesn't want out, truth about government crimes or lies that the public needs to know to act as a democracy". Experts describe Manning as a patriot with no anti-American sentiments. “What [Manning] did came from a place of patriotism. He’s in no way anti-American and never expressed anti-American sentiments in any way,” argues the author of ‘Private: Bradley Manning, WikiLeaks, and the Biggest Exposure of Official Secrets in American History’ Denver Nicks. Former MI-5 whistleblower Annie Machon told RT that President Obama has an appalling track record when it comes to cracking down on people seeking to enlighten the public. Critics are saying there is a general problem with transparency in the US. “[The US’s] problem is a cult of secrecy, extreme levels of dystopian secrecy. Washington classified 92 million documents in 2011. 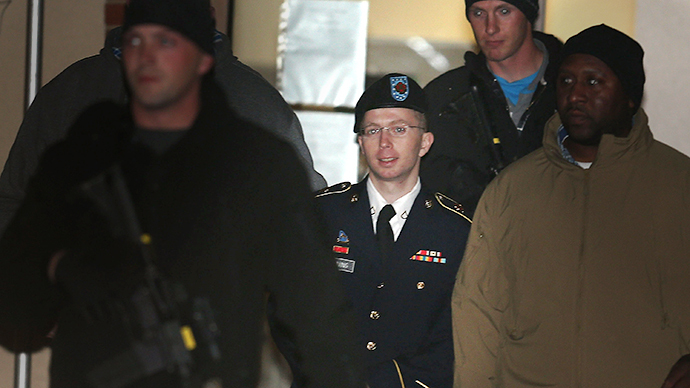 To put things in perspective, what Bradley Manning leaked is less than 1 per cent of that,” civil rights attorney and author of ‘The Passion of Bradley Manning’ Chase Madar told RT. 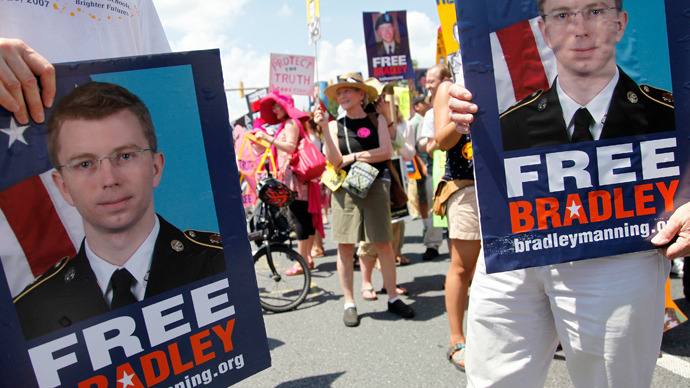 A vigil for Manning is planned for early Monday outside the gates of Ft. Meade, and supporters that have traveled from around the world to attend the proceedings hope to secure a seat in the courtroom during the first day of hearings. The Army has already set aside 12 weeks for the hearing and acknowledged last week that hundreds of media organizations requested credentials to cover the trial. RT plans to provide updates on the case Monday and throughout the trial.